If you have driven on a freeway lately, you have undoubtedly been frustrated with a semi-truck. Yes, they are a necessary part of the country and without them store shelves would be empty. However, that doesn’t mean it’s okay for some (not all!) truck drivers to drive way too aggressively for how big of a vehicle they are controlling. Even for the mild-mannered truck drivers, 18-wheelers can pose a serious risk on the highway. What are the risks of semi-trucks on the road? To start, they are big. Really big. Any move they make is magnified by their size. If they want to brake, it takes a long time. If they want to turn, they have to do it slowly. If you thought your blind spot was bad, you should try being in a semi. Not to mention, most truck drivers are paid by the trip, not by the hour. This means that the faster they can get somewhere, the more their hourly rate will be. The result is that truck drivers don’t like to stop. They sleep minimal amounts to help them reach their destination faster. 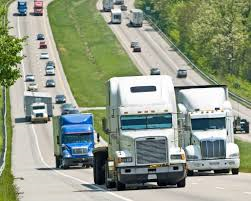 As with most things on the road, the number one thing you can do is drive defensively around 18-wheelers. If you keep your eye on the semi, and understand how it has to operate, then you can relax a little bit around them. The best rule of thumb is to pass a semi as quickly as you can while still being safe. Nothing good can come from hanging out next to a semi. You are likely in his blind spot, which means he can sideswipe you without even realizing it. If you are near a semi truck, you always want to keep an eye out for a blinker and slow down if it seems like the driver is trying to make his way into your lane. You also want to take extra care to give a semi plenty of space when he is making a turn. And please, don’t cut an 18-wheeler off. It takes him a lot longer to stop than you think, and you are putting yourself in unnecessary danger. Even though sharing the road with semis can be frustrating at times, safety should always be a priority. Because if something goes wrong, your car is the one getting smashed.